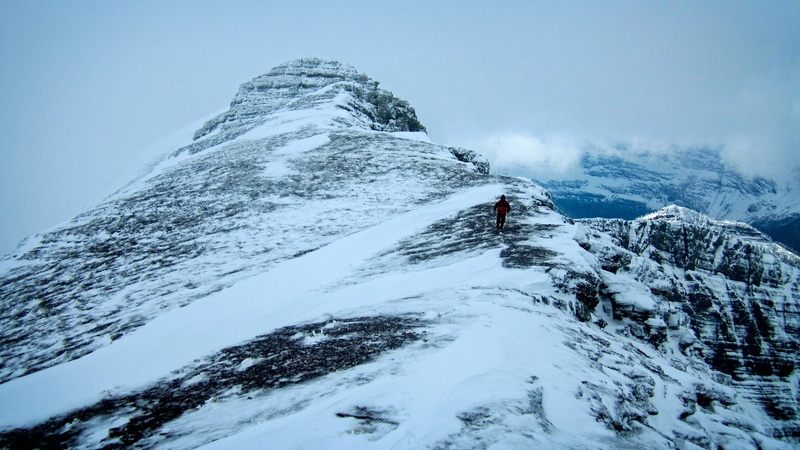 Since weather conditions made it impossible for me to take a comprehensive picture of Mount Carthew (2636m), my thanks go out to Mark Kadijk who took this picture a few weeks earlier in August 2015. 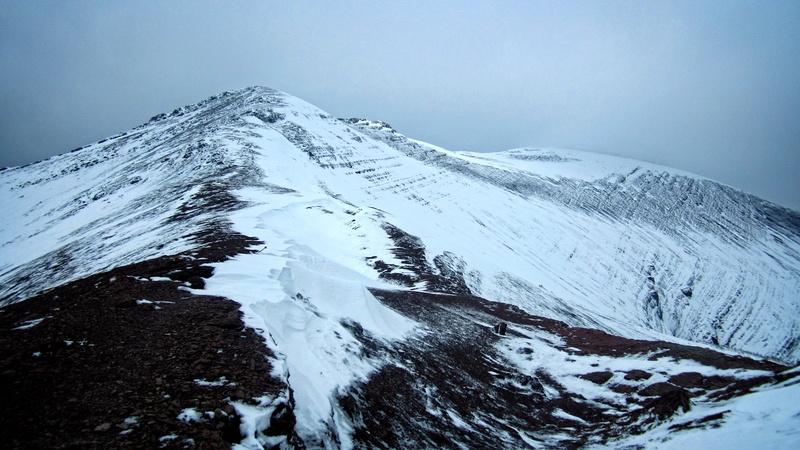 The summit is on the right. In Monty Python and the Holy Grail, there is an animated interlude between the scene where King Arthur gives the Knights Who Say Nee a shrubbery and the scene where they meet Tim the Enchanter. In it, the narrator describes how over the course of a year, “winter changed into spring. Spring changed into summer. Summer changed back into winter, and winter gave spring and summer a miss and went straight on into autumn…” To me, this has always been a perfect summary of the weather in southern Alberta. For example, the night before Melanie and I were married in August of 1992, there was a major snowstorm which sent us into panic mode for a few hours as highways were closed and power lines were knocked down. The next morning the sun was shining, temperatures were back into the mid-20s, and our wedding went off perfectly. 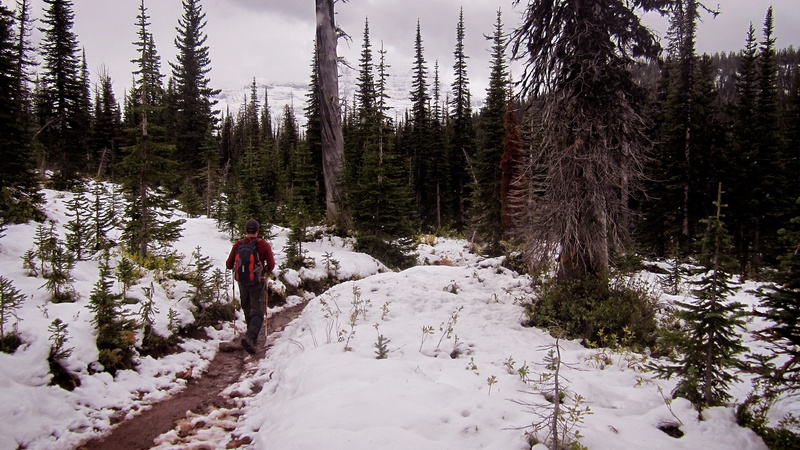 September 2014 is remembered as ‘Snowtember’ after a major storm hit the Calgary area and just this past August (coincidently on the same date as in 1992), it snowed again in southwestern Alberta. In this part of the world, you just never know when summer will unexpectedly change into winter, especially when you’re in the mountains. 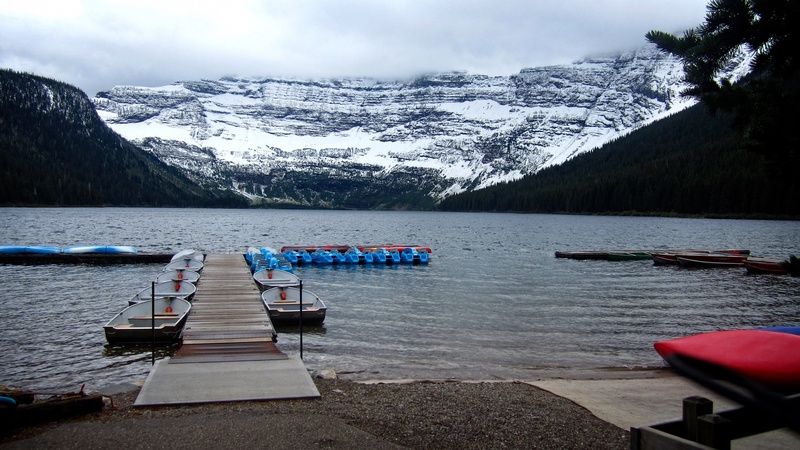 So it didn’t completely surprise us that after a few days of inclement weather, Jeff and I could see that most of the peaks in Waterton were covered in fresh snow. 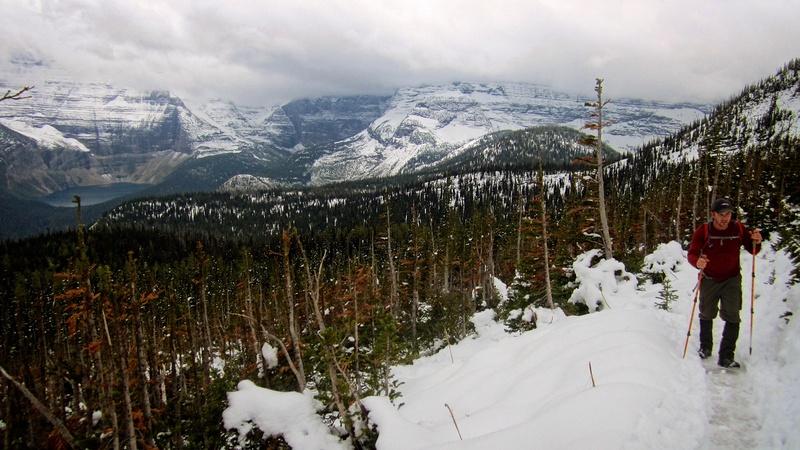 Not knowing how deep or how icy things would be at higher elevations, we decided to pick Mount Carthew because it’s one of the easier summits to tag in Waterton. 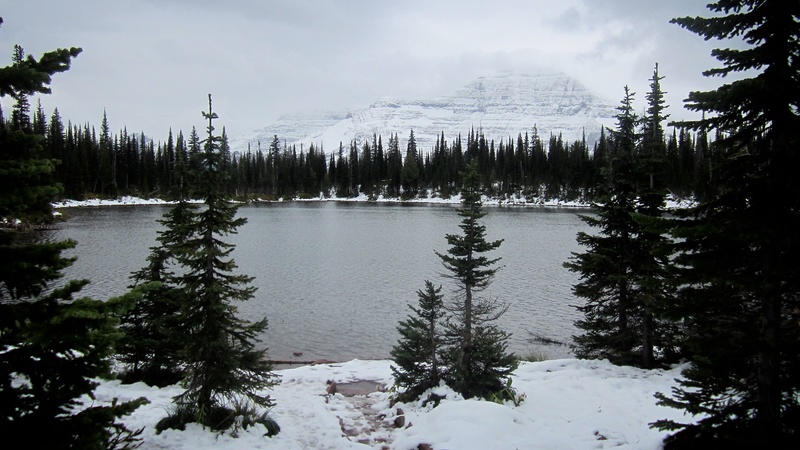 Even though the forecast had called for afternoon clearing at higher elevations, there were still low, dark clouds obscuring the summit when we started up the Carthew-Alderson Trail. 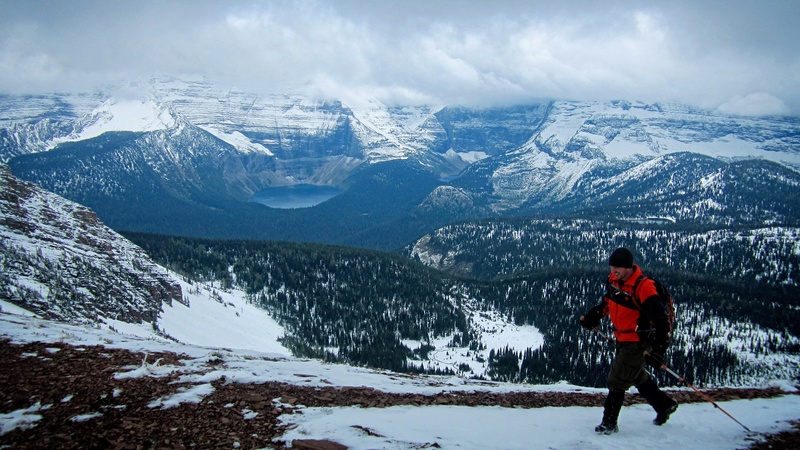 We’re generally prepared for all weather conditions when we go hiking, so the metre deep snow drifts and the raging blizzard that we encountered along the summit ridge didn’t stop us, but it did prevent us from enjoying the views. Nevertheless, and this may sound odd, it was still a fun day because it was an adventure, and as Amelia Earhart noted, that is worthwhile in itself. 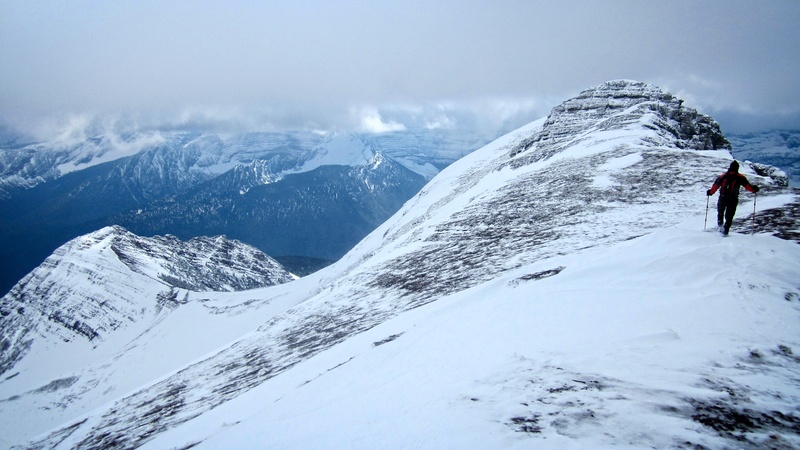 Our route can be found in Alan Kane’s, Scrambles in the Canadian Rockies and also online through many excellent trip reports. We started at the Cameron Lake parking lot and once across the bridge, followed the Carthew-Alderson Trail for 47 minutes until we reached the shores of Summit Lake. From here we continued up the Carthew-Alderson Trail until we came to Carthew Ridge. 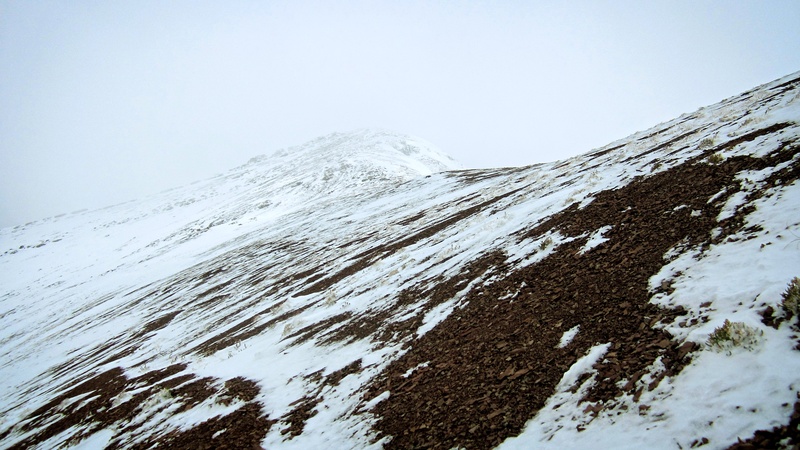 After gaining the Ridge (which is oddly called Carthew Summit) we then left the trail and followed Carthew Ridge northwards up to the summit ridge. From there we hiked ~1km to the summit. Kane rates this scramble as easy and under normal conditions it would be. 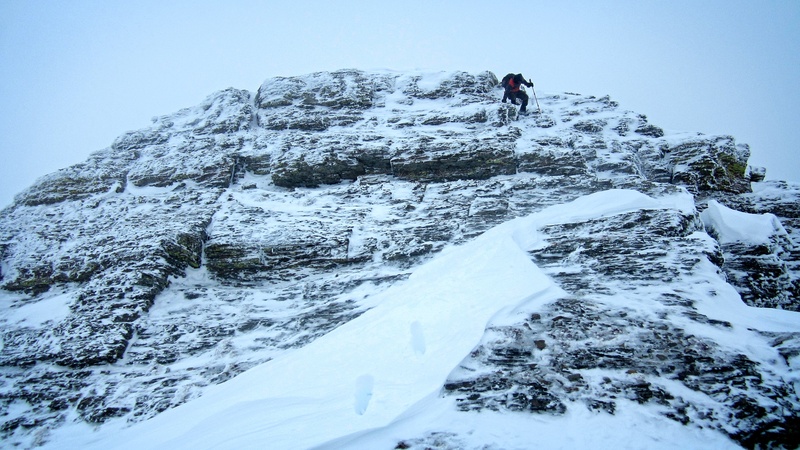 On this day however, the intense winds combined with snow and ice made it a little more challenging. 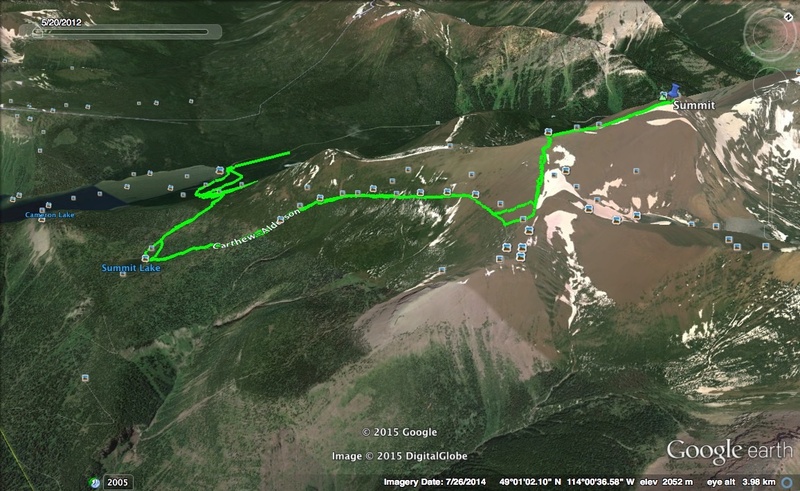 The roundtrip distance was 18.4 km with a total time of 5 hours and 48 minutes. 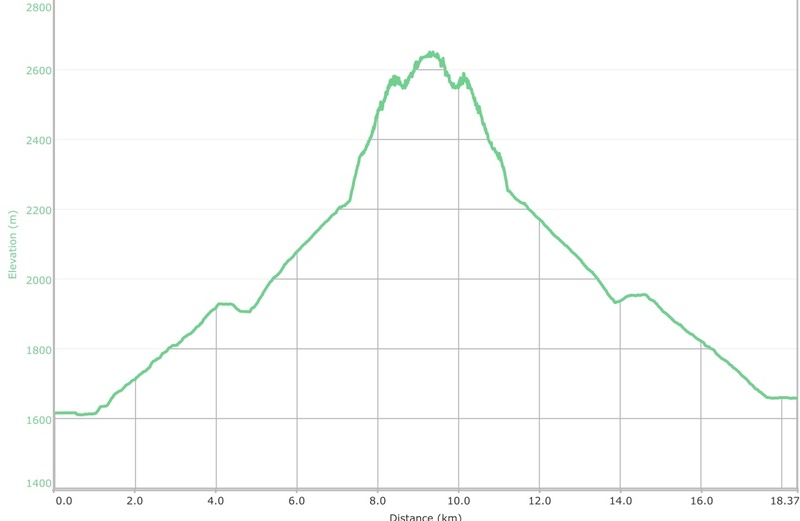 Total elevations gains were 1206 m.
There seems to be some confusion surrounding the height of Mount Carthew. 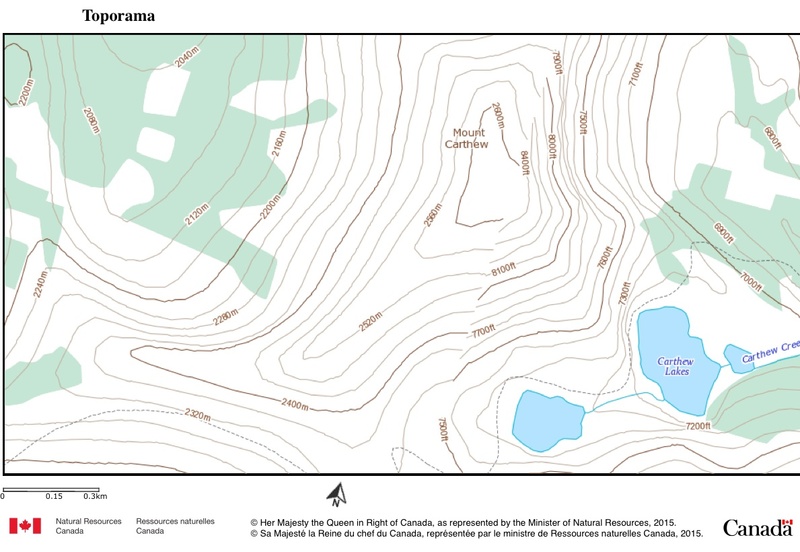 My GPS said 2645 m on the summit while some maps (including the one given to me at the Park gates) say that it is 2420 m while others say either 2618 m or 2636 m. I thought I’d check for myself on a topo map and it would appear that Carthew is definitely over 2600 m but not over 2640 m. To compensate for inaccuracy on the part of my GPS, I’m going to say it’s 2636 m, which also lines up with other trip reports. 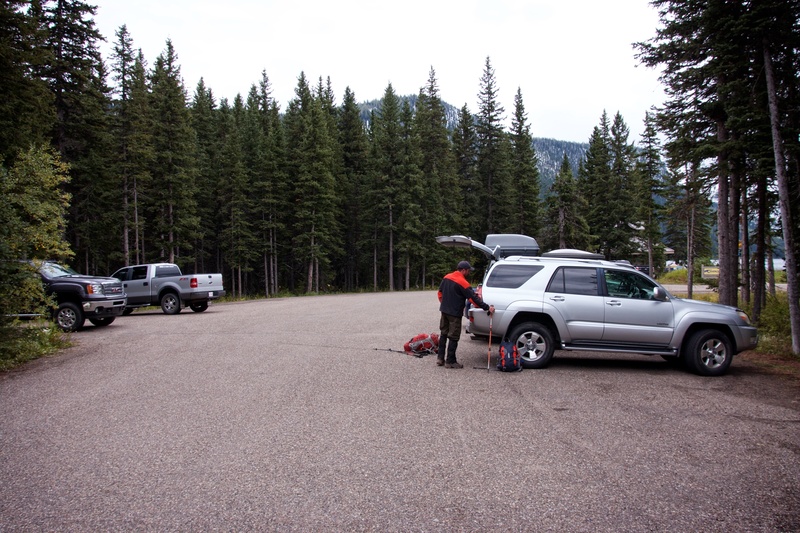 Gearing up at the Cameron Lake parking lot. 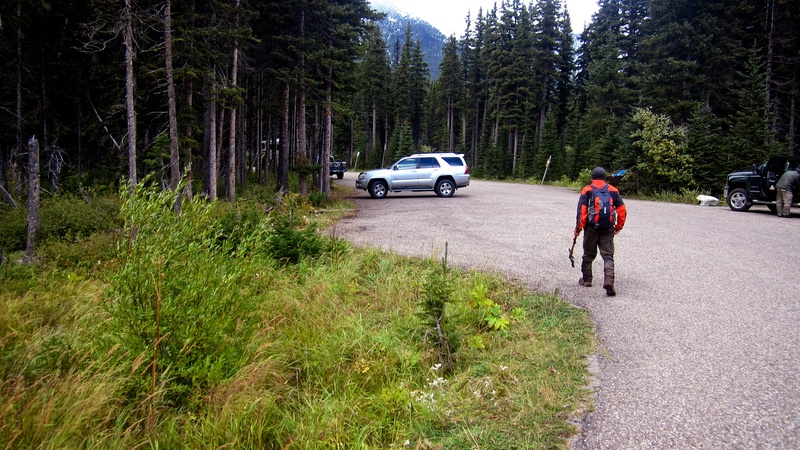 Parks Canada had four security guards patrolling the lot to prevent Labour Day parking issues. I can’t quite put my finger on it, but for some reason I was just not feeling like my usual self. I must have been tired from the big family dinner at our house the night before – that or the from the tire swing in our backyard. The dock on Cameron Lake. Low clouds and snow were the order of the day. The trail starts to the left of the boat launch and across the bridge. The entire approach is quite gradual and well maintained. There are even stepping stones that have been incorporated into low points along the trail. 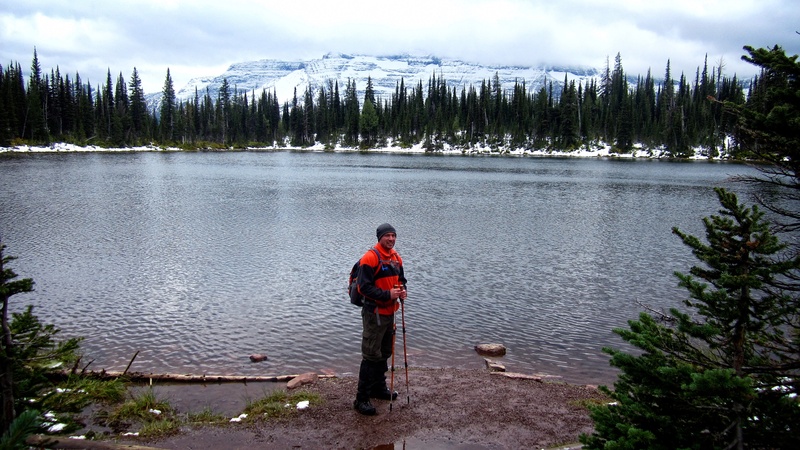 Not long after starting out we gained our first views of Cameron Lake. 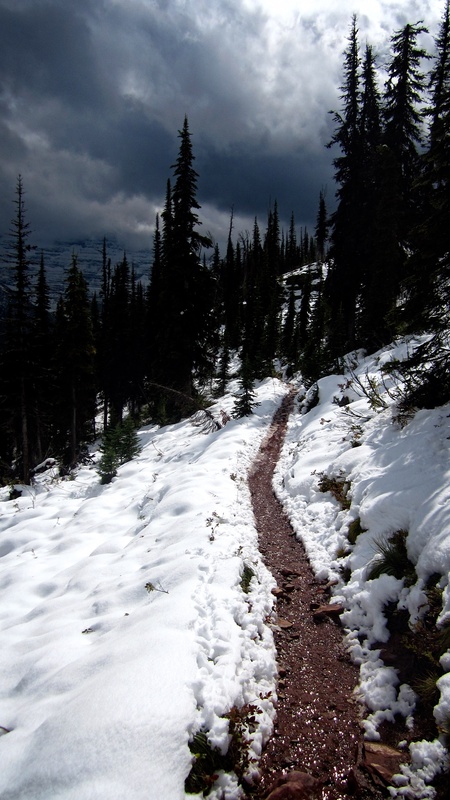 While the lower portion of the trail was free of snow, the entire upper section was covered. 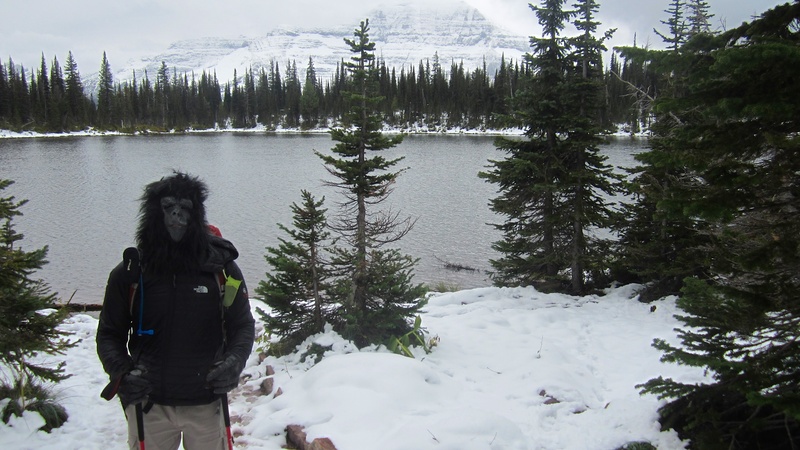 Here is where we encountered other hikers who were planning on making the trip to the Waterton townsite in only running shoes and shorts. I’m assuming that they turned back once they got closer to Carthew Ridge. 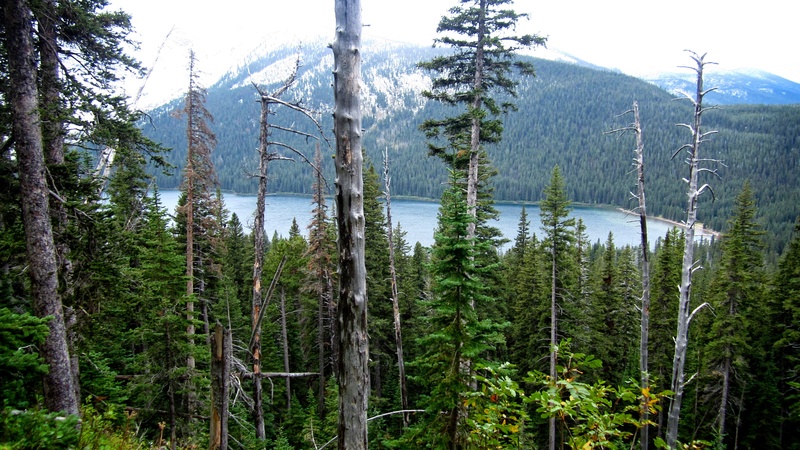 After 47 minutes of hiking we arrived on the shores of Summit Lake. Even at this point I was still feeling somewhat abnormal and to top things off, my eyes were stinging because I’d been peppered sprayed twice by other hikers. For whatever reason, instead of saying ‘hello’ these rude people screamed and then sprayed me – and only me and not Jeff. So much for friendship on the trail! 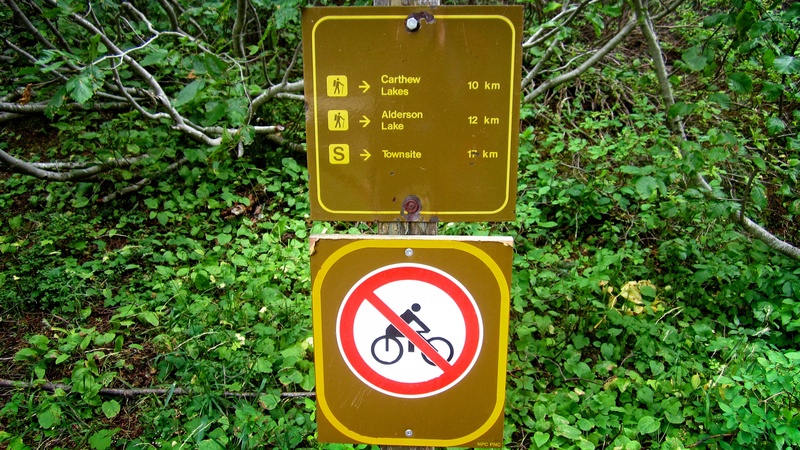 The Carthew-Alderson Trail forks at Summit Lake. 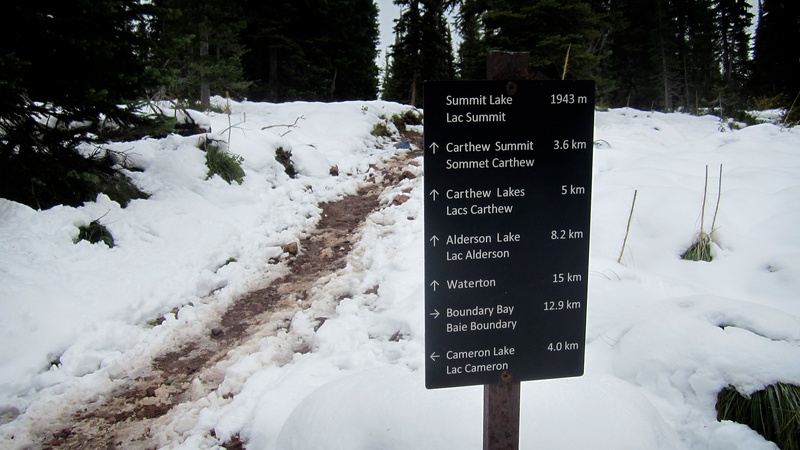 We followed the path which led to Carthew Summit – which is not really a summit at all but rather the highest point of elevation along the trail. 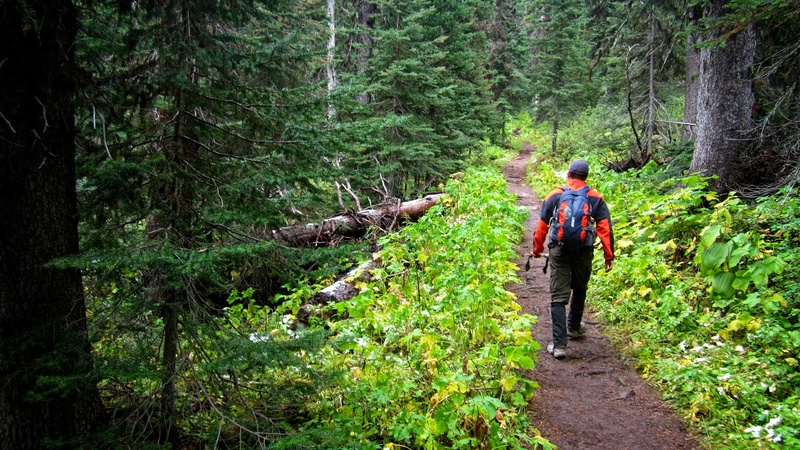 After Summit Lake, the trail winds gradually through the forest until it comes to the open slopes beneath Carthew Ridge. 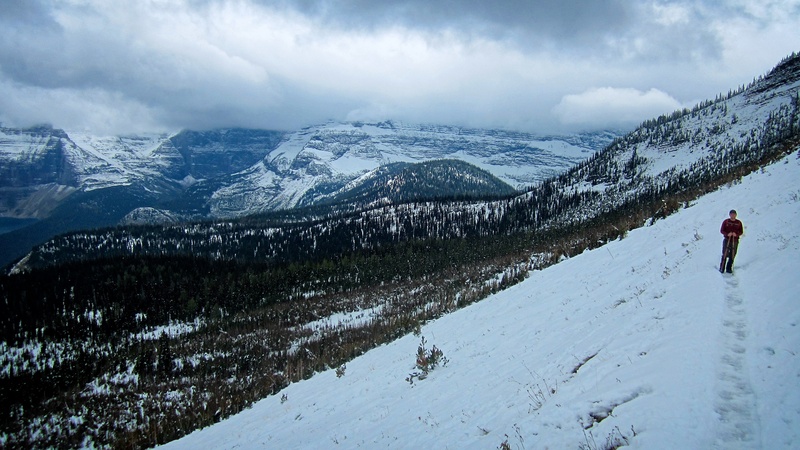 Low clouds hang over the summits of Mount Custer (right) and Chapman Peak (left). 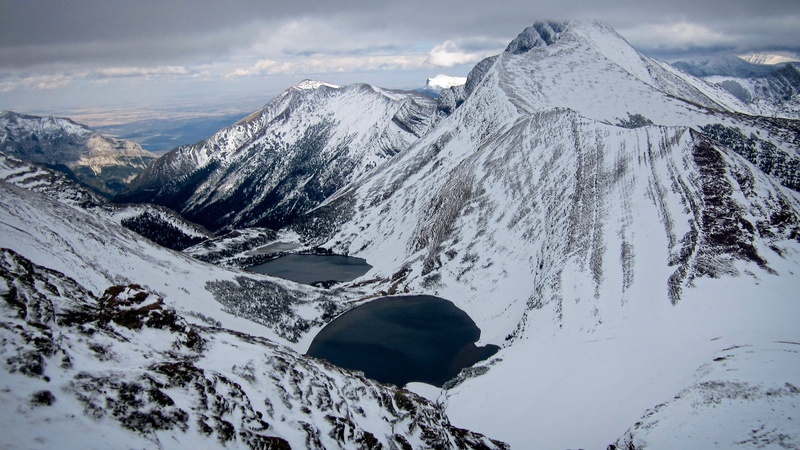 Lake Wurdeman is also on the left. 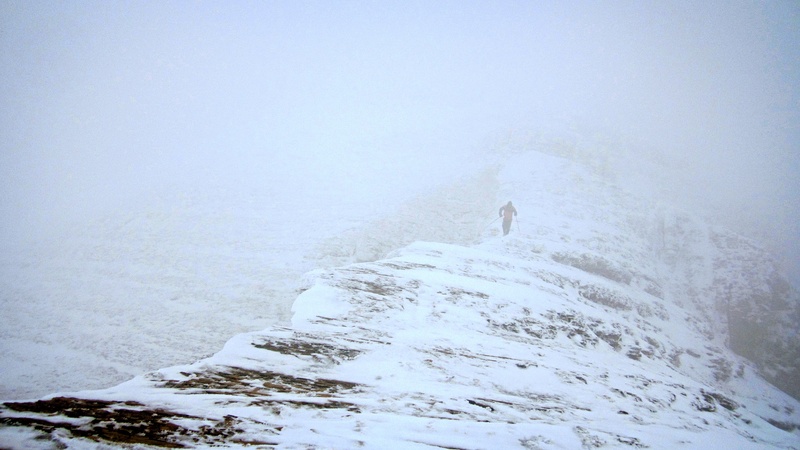 After reaching the open slopes of Carthew Ridge we began to run into groups of other hikers who had turned around after encountering blizzard-like conditions and metre deep snow drifts on Carthew Summit. 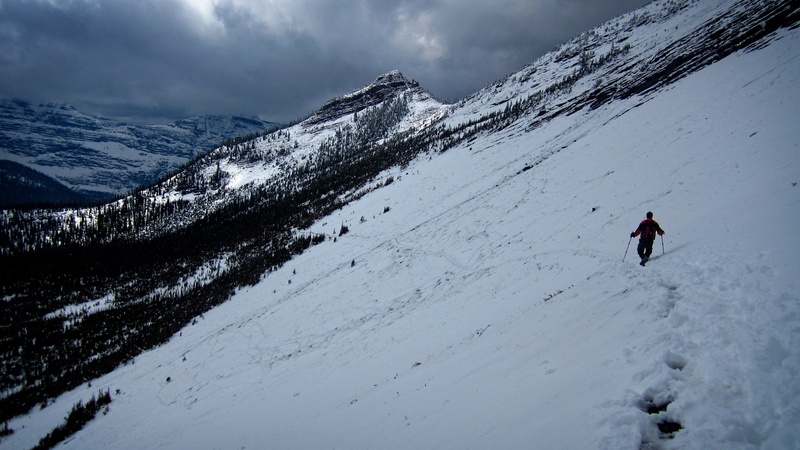 Others had given up even before this point because the trail leading up to the ridge had become too steep and icy. 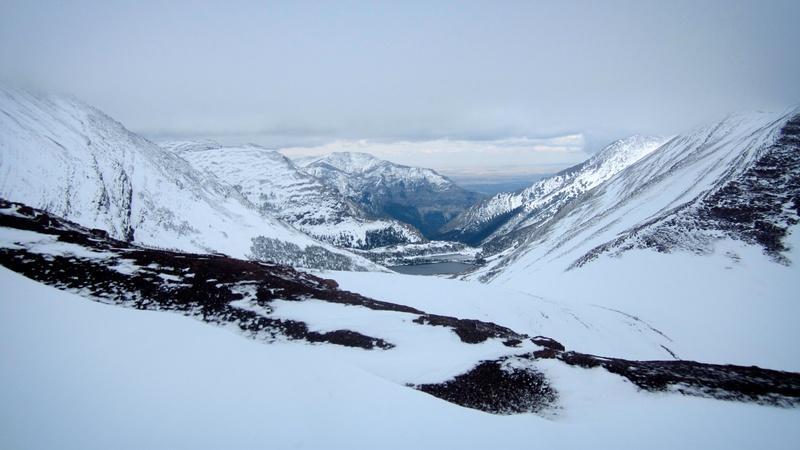 Many of these hikers had only low cut hiking shoes or runners and those who did have boots, did not have gaiters, so tramping through deep snow would not have been pleasant. 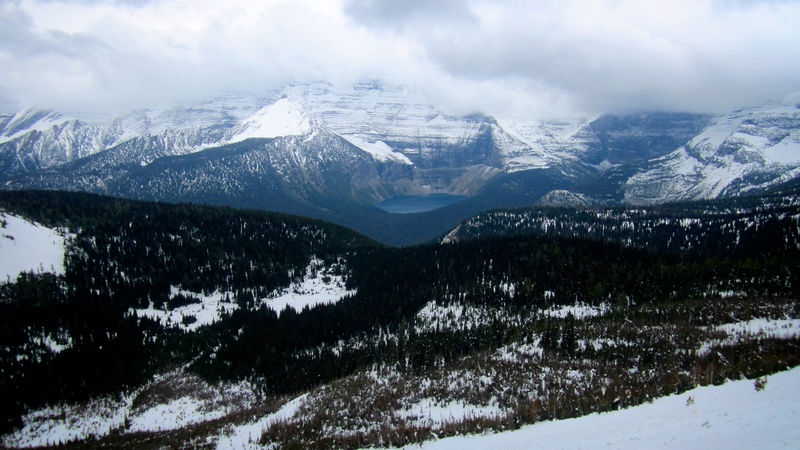 Looking into Glacier National Park at Lake Wurdeman and Chapman Peak. 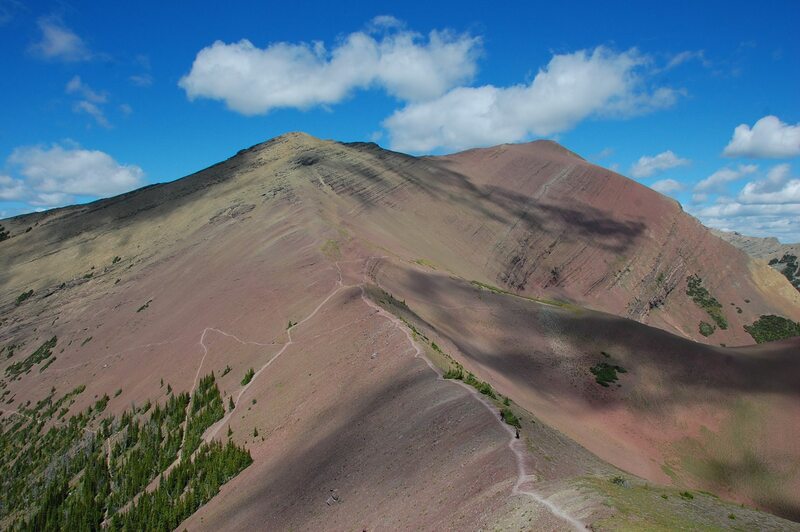 When we reached a point near to where the trail begins to switchback up to Carthew Ridge, we saw that there was a group of at least 15 hikers trying to claw their way up. Some had made it, but others seemed to be stuck in the snow and having a miserable time of it. 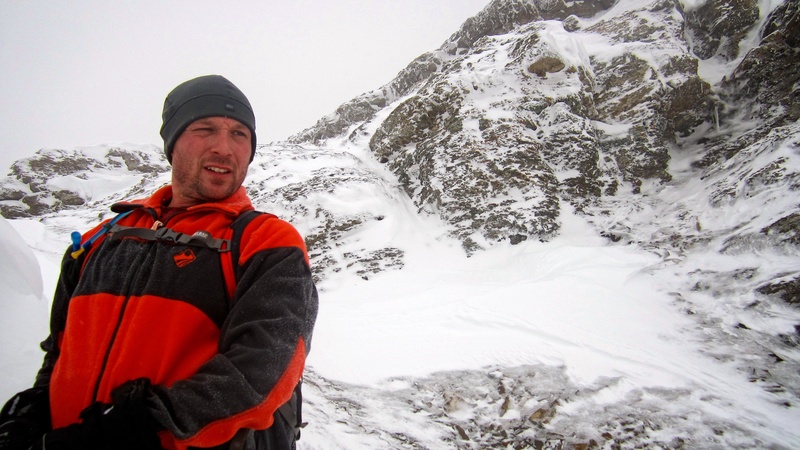 Jeff and I decided to avoid this bottleneck and leave the trail by kick stepping our way to the top of the Ridge. This was a good decision because we topped out long before many in the group did, and most importantly, it allowed me to avoid being peppered sprayed again. 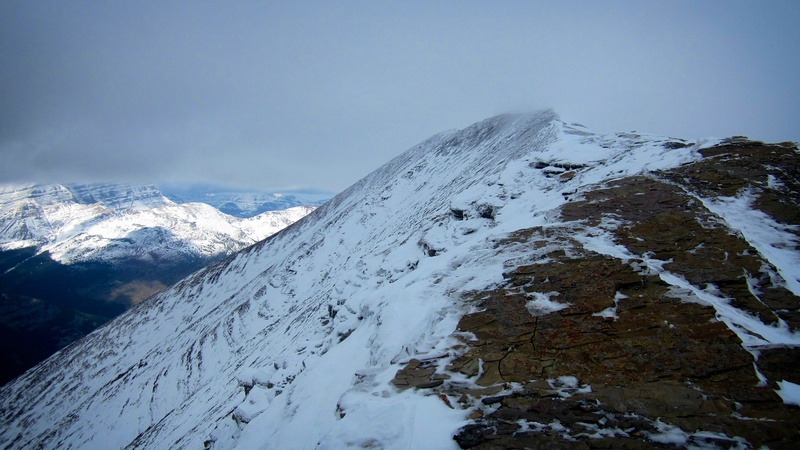 Carthew Ridge and the cloudy route to the summit ridge. On top of Carthew Ridge and looking towards Carthew Lakes. 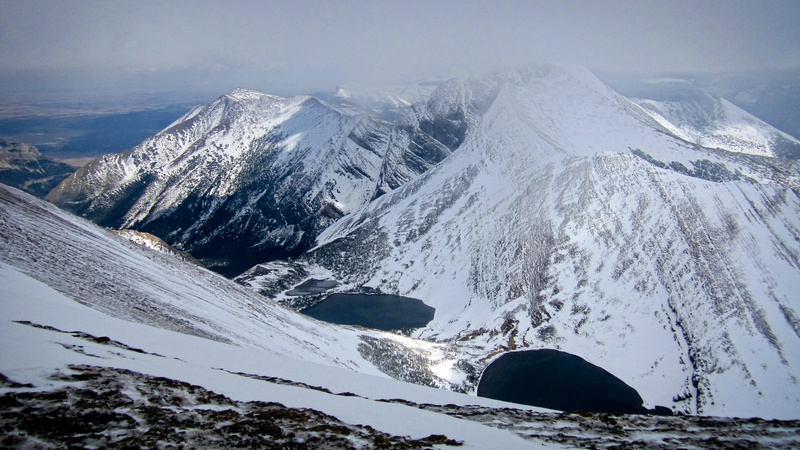 Only the summits of Mount Crandell (centre) and Bertha Peak (distant right) were cloud free. 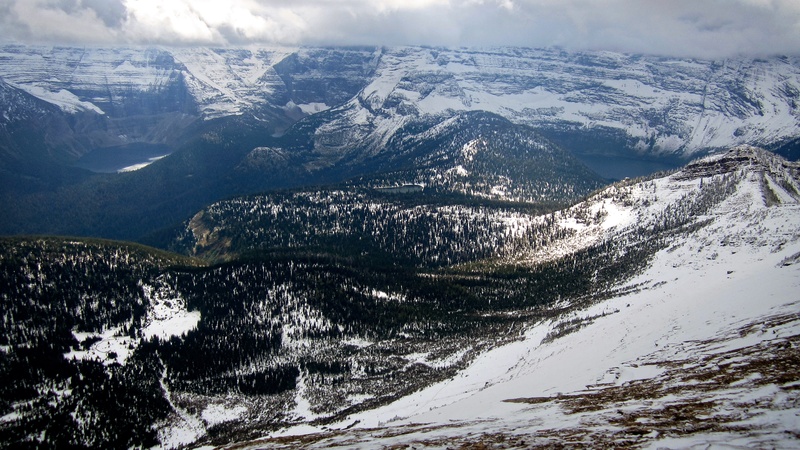 Mount Alderson (right), Buchanan Peak (middle left), and Carthew (left) didn’t show up for the party. 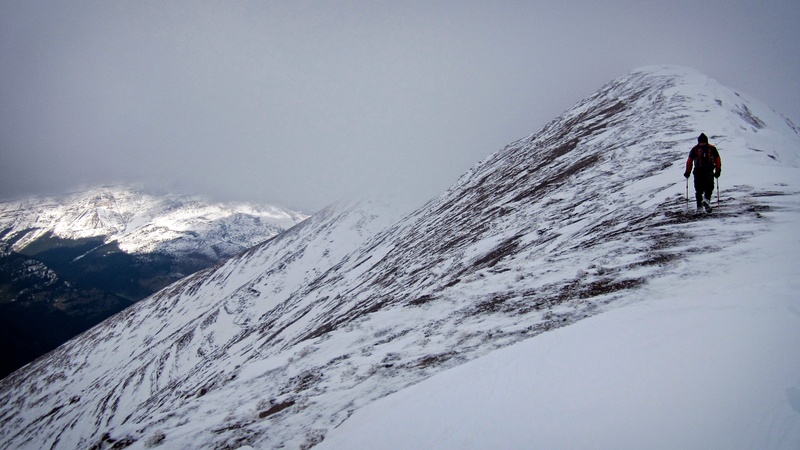 Looking along Carthew Ridge to the southwest. 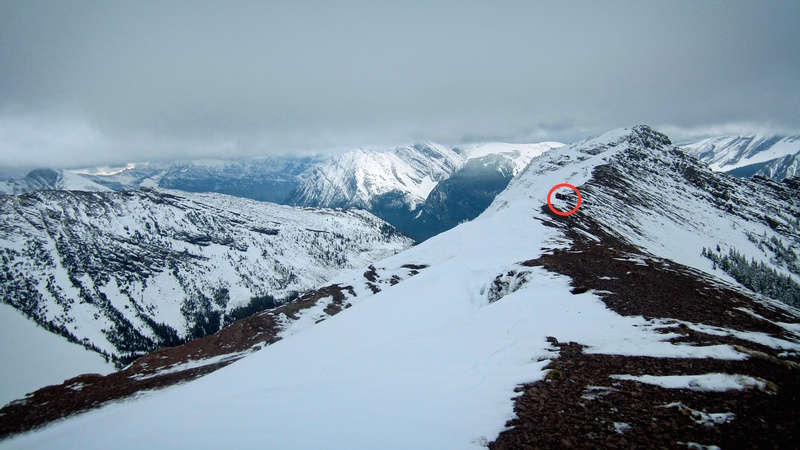 A group of hikers can be seen huddled together (red circle) while they wait for the rest of their party to join them. They would soon turn back. 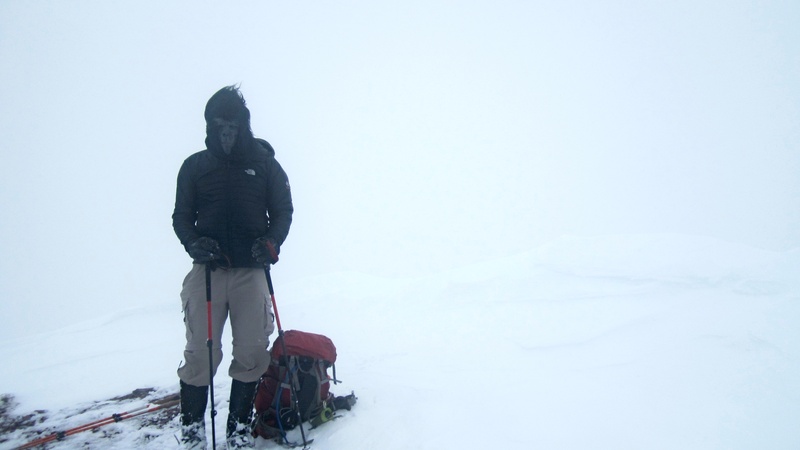 The wind really picked up once we were on top of Carthew Ridge. 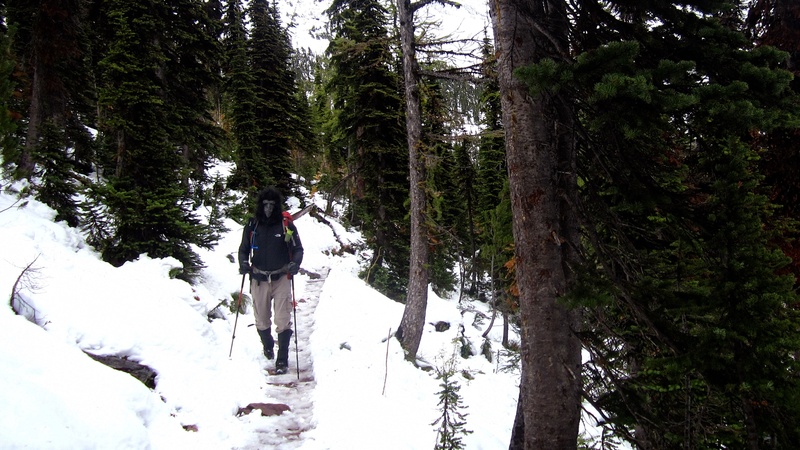 Heading up to the summit ridge. Looking down at Carthew Lakes. The views would be much better on our descent. 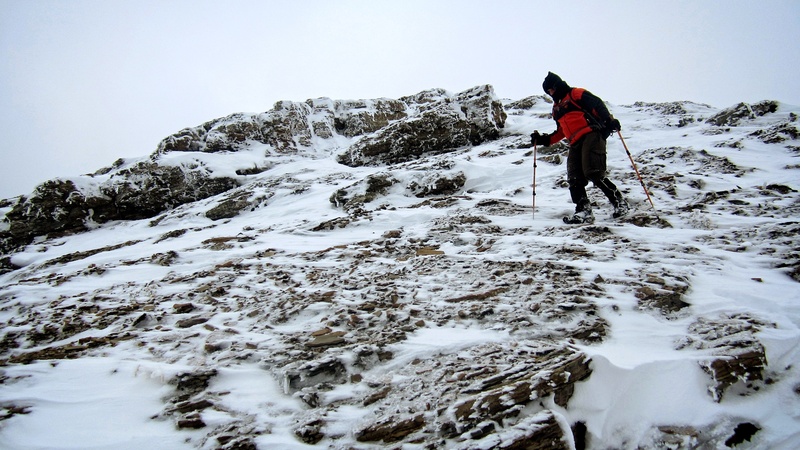 Fortunately we could avoid most sections of ice covered rock. 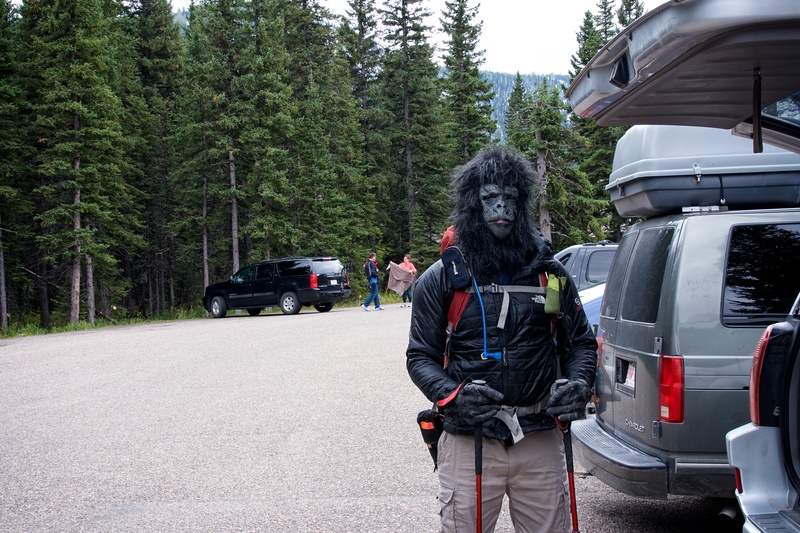 This was the moment where Jeff looked back and inexplicably began calling me, Dr. Zaius. 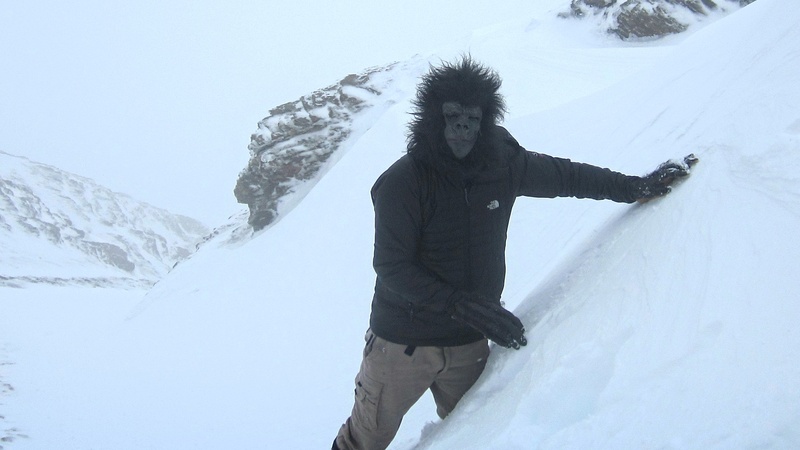 Despite the hairy conditions, I was shocked that I didn’t need anything more than a light jacket. While Jeff had to use a full face mask and winter gloves, I got by quite nicely without them – though for some reason I had trouble manipulating my thumbs. 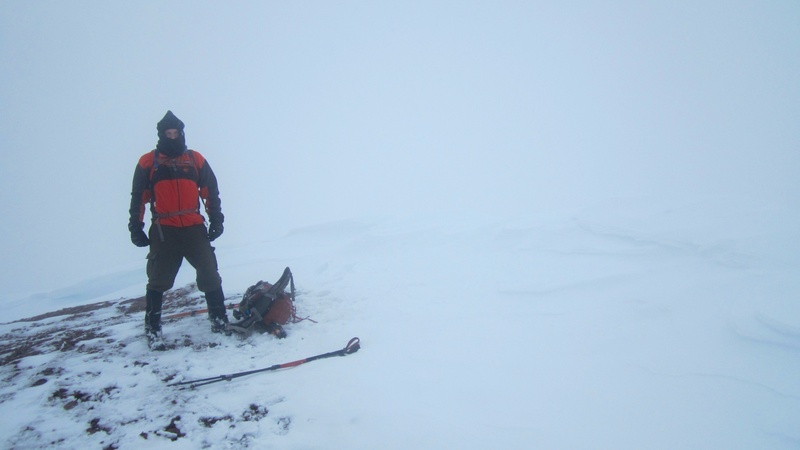 On the summit ridge and in the middle of a blizzard. 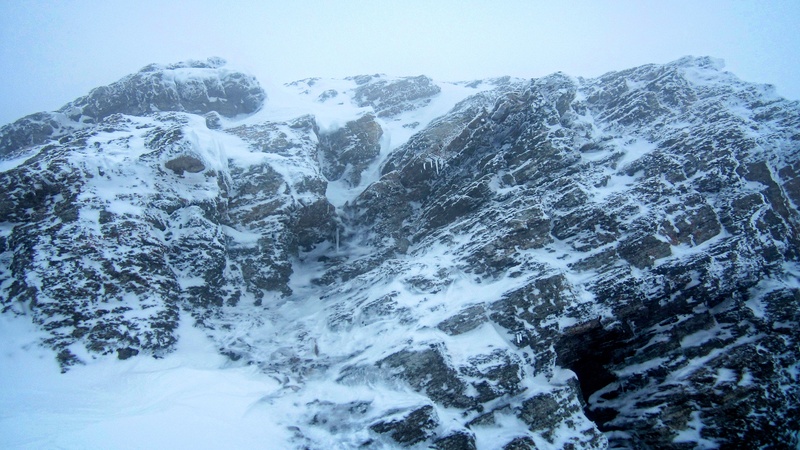 The wind combined with the snow and ice covered rock made what would normally be a routine hike, into something a bit more challenging. A brief moment of visibility. Jeff walks along the ridge towards the invisible summit while to the north, the sun begins to tease us. The summit of Mount Carthew is close! 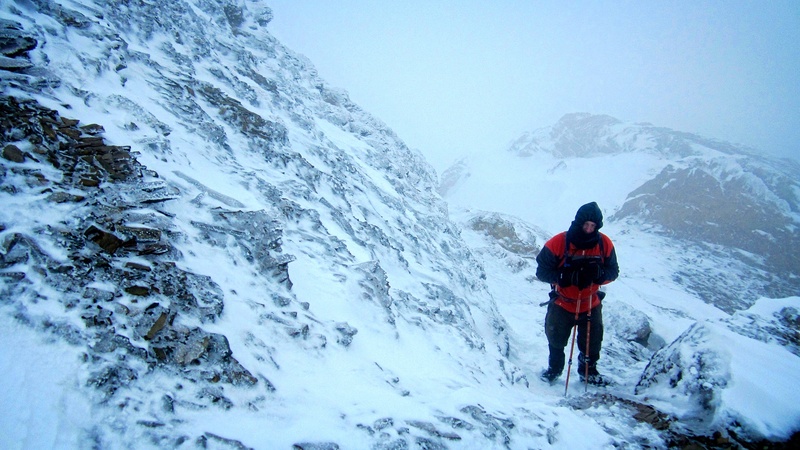 Conditions on the summit ensured that our stay was brief. 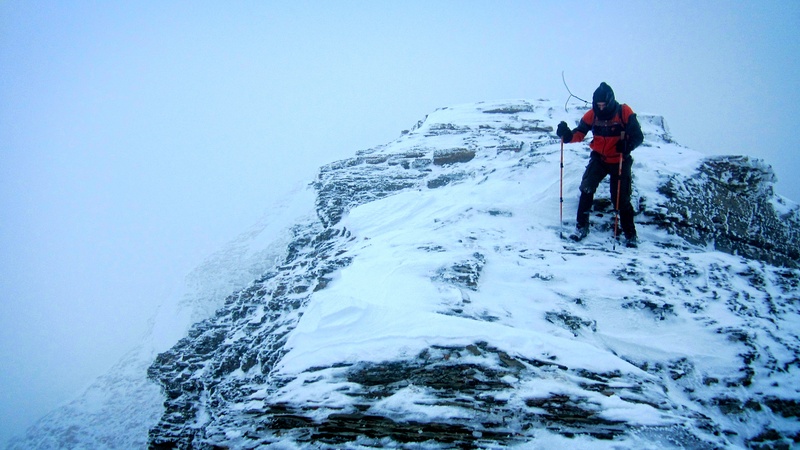 We actually had to be careful because there was a cornice just behind the summit which masked the edge of a cliff. 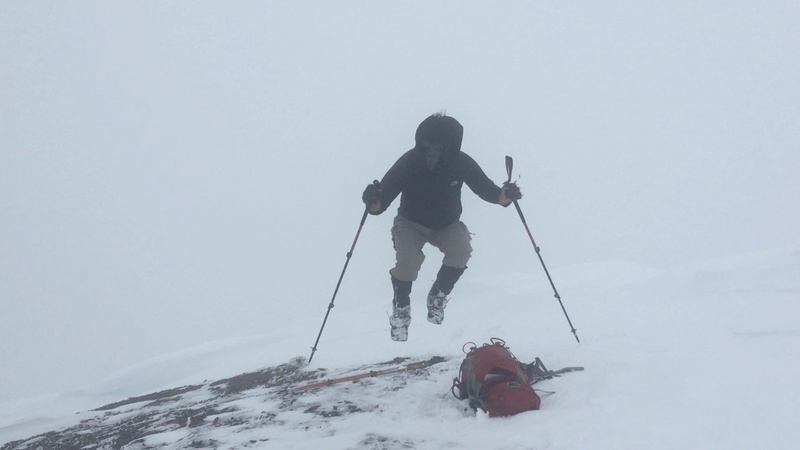 The whiteout conditions made it difficult to differentiate the sky from the snow covered ground, making it easy to inadvertently step on the cornice and fall through. Jeff on the summit of Mount Carthew. Isn’t this magical? 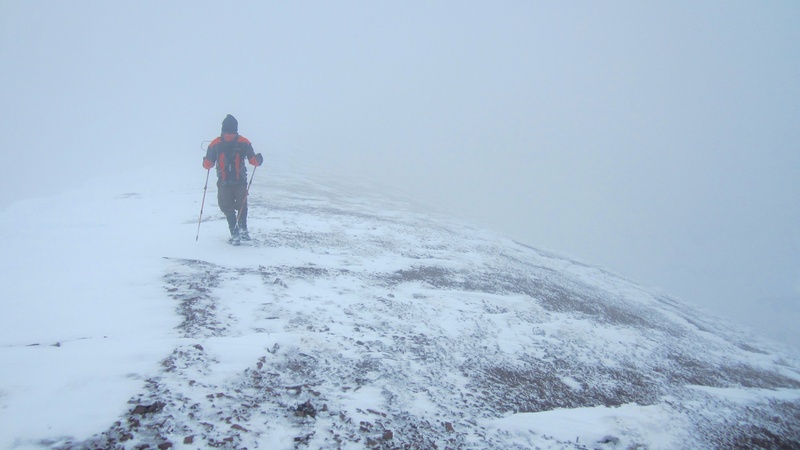 Heading back into the wind and the snow. The skies cleared somewhat during our descent. 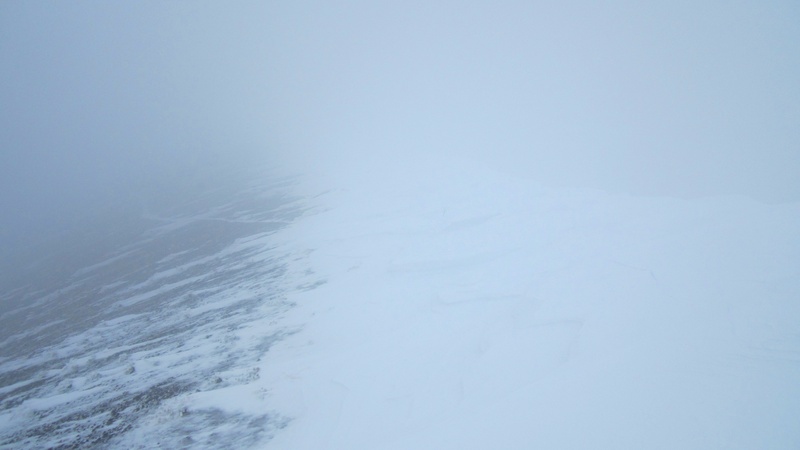 This is the view down to Carthew Ridge. Sunlight! 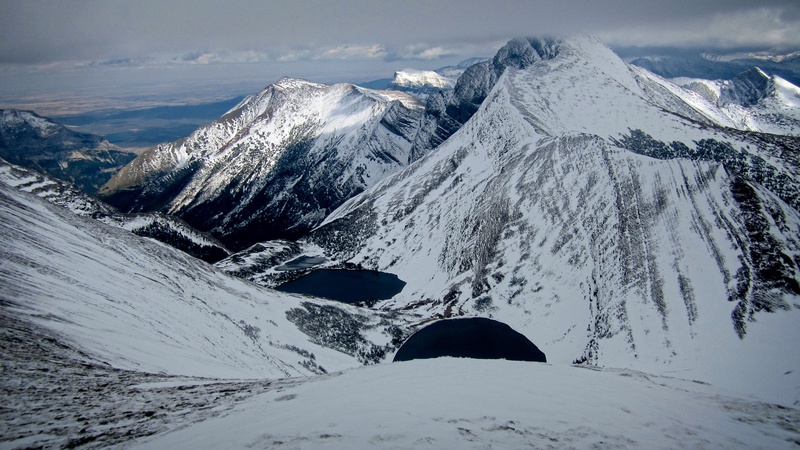 Bertha Peak (left), Mount Alderson (right) and the Carthew Lakes. The appearance of sunlight made us look back towards the summit. Did we leave too early and miss the views? Nope. 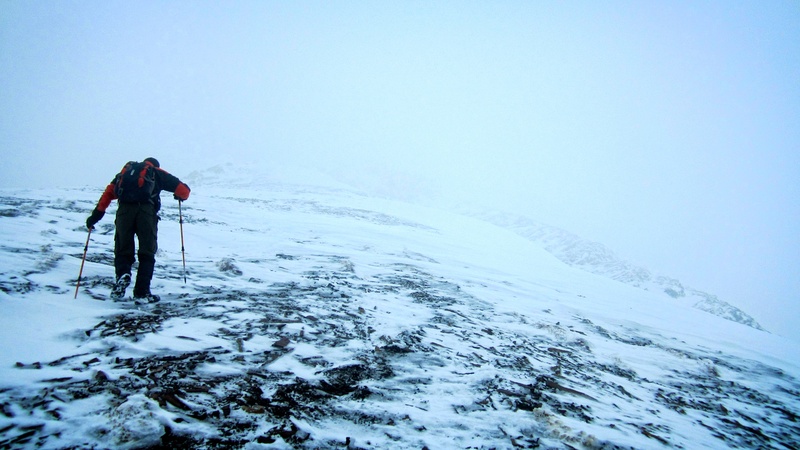 The summit remained shrouded in clouds. Since there were no summit views, I’ll include another picture of Bertha Peak and Mount Alderson. Looking down at our approach route along the Carthew-Alderson Trail. Lake Wurdeman is visible on the upper left. 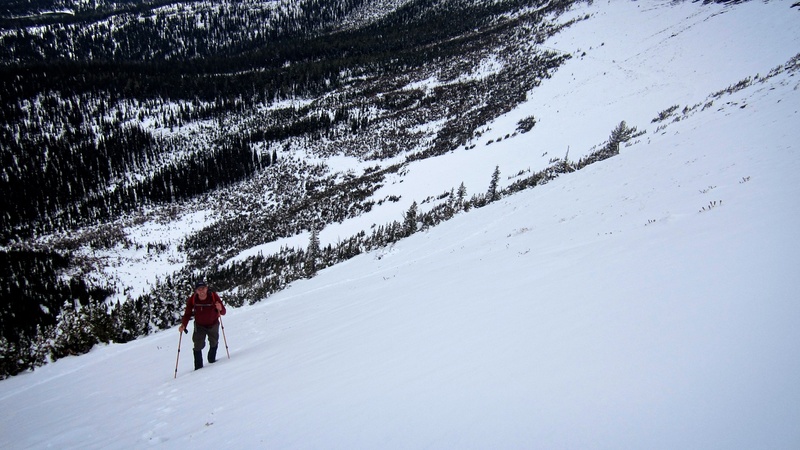 Descending down to Carthew Ridge. When there are no other views, why not include a third version of the same shot? Looking back at Mount Carthew from Carthew Ridge. 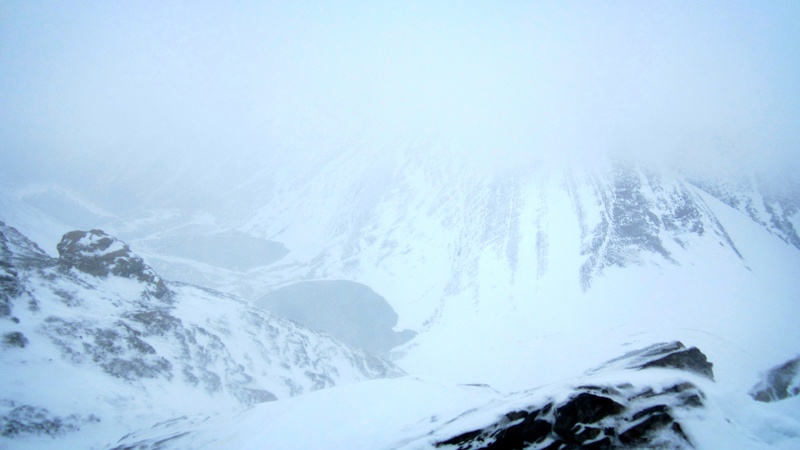 The summit (somewhere on the right) remained obscured. Back on the Carthew-Alderson Trail and heading home. While we encountered several hikers on our way up, we didn’t come across a single person on our way down. I was glad because I was worried that I’d run into an American dentist looking for big game. Melting snow turned the trail into a little creek. Jeff on the shores of Summit Lake. We really enjoyed the gradual descent back to the vehicle. 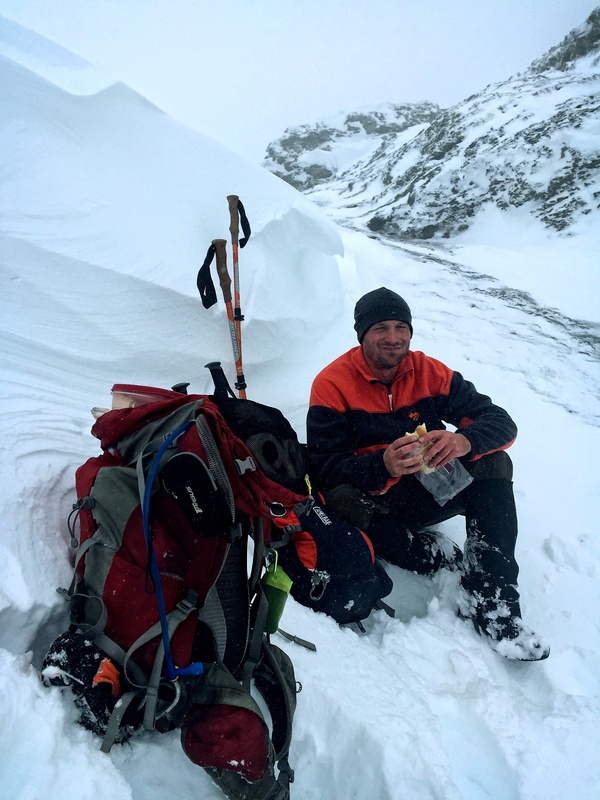 Anyway, despite discovering winter a few months early, we enjoyed our time on Mount Carthew and look forward to a return trip(s) to tag the summited of Mount Alderson, Buchanan Ridge, and Buchanan Peak – though hopefully under less hairy conditions.